I swear, it was mad ugly. I cannot even find a photo as ugly as how ugly this tree was. I picked it out rather quickly, I admit. As it settled in its stand in my living room with its thawing branches glistening and relaxing into shape, it became clear that it was the ugliest tree I had ever seen. The huge gaps between the branches were wide enough to allow for a large neighborhood of tree houses to be built on it. My entire extended family was coming in for the holidays and I had to do something about this hideous tree. I decided that I would string the lights around it, decorate it and fill the holes with extra ribbon and bows. The thing is that I had purchased it from the nursery my brother-in-law managed and he had not only delivered it to our home but he had set it up for us on the stand. 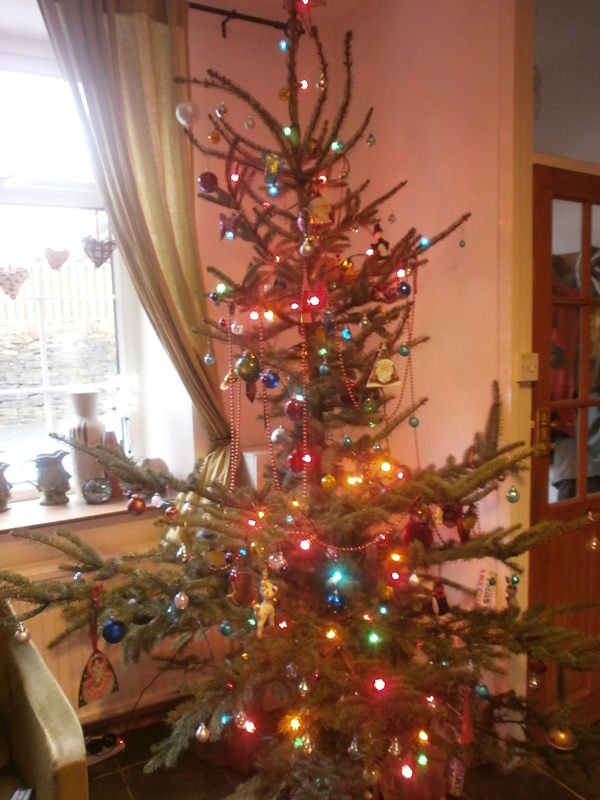 I tried, I really did but there was no beautifying this ghastly pine. Mr. B was not pleased, with me that is. You can’t just return a Christmas tree! We bought it, we are stuck with it. There is no way I am calling my brother and telling him that you don’t like it. I promised that I would take care of the whole thing and sweet talk my way out of this most awkward situation. After all, I couldn’t possibly be the only person in this planet to ever return a Christmas tree, could I? I proceeded to undecorate it and strip it free from any possible signs of Christmas cheer. Then, I called my brother-in-law who happened to live right next door, to come over to take a look at the tree in question. I pointed out every hole, front to back and told him that I could not tell my family that the tree had come from his place of work because it would give the business a bad name. Didn’t he want me to have a beautiful tree I could brag about and thus, complimenting his work? The next day, I returned to the nursery and carefully picked out the most fabulous and beauteous Christmas tree, for all to enjoy. Please tell me that you or someone you know has returned a Christmas tree. I used to buy the first tree we touched at the lot, figuring any holes were the perfect spots for the BIG ornaments! I HAVE however, returned a brand new car two days after buying it, and got my traded-in car back….all because I had a “bad vibe” about the new one. Nope. You’re the first person I “know” who’s returned a Christmas tree. My Santa hat is off to you. Hope you have a wonderful holiday, and the best tree ever. Hello Sherri! This IS serious business! 🙂 The tree this year is smaller than usual but I actually opted for simpler. It’s nicely shaped and everyone is pleased. Gracias, amiga! Nope. I have never returned a tree. However, back in 1988, I did purchase one off the driver of a pickup truck that cruised through a gas station at 6:00 a.m. in the Albuquerque barrio with a load of trees, slowing only long enough to call out to customers before taking my $5, rolling a tree in my direction, and burning rubber down the street. Lucky for me, as I only had $5 that year for a tree. It was a gorgeous. But if it makes you feel better, I definitely WOULD return a Christmas tree if I had to. Except not to the guy on the pickup. Didn’t want to think too hard about how he acquired his inventory. . . . New Mexico. A whole other country. Um, I wish I could say I returned a tree. But I would have returned that tree. My sister-in-law definitely would have returned it. She decorates trees for people over the holidays and there’s no way she would have allowed that tree to stay. I hope your brother-in-law got over it and could laugh about it later. Glad you could get a better tree. Hope you have a wonderful Christmas. You win for most chutzpah! Returning a Christmas tree… I’m still laughing! I don’t know if chutzpah is the word or just plain crazy! Maybe I knew deep down that my BIL would do anything for me. I helped him out a lot when he went through a very difficult time. 🙂 That’s what family is all about, right? Actually… when I was growing up, my best friend’s grandmother (who I adopted as my own) would always buy her Christmas tree from our church. And she would wait until late to pick it. She would pick the one tree that no one else would buy. The one with the hole on one side, or whatever defect that made it undesirable. And it was always decorated with garland and ornaments that came from her many grandchildren. That said, I love your balls in taking your tree back to get one that looks great! No worries. To each, their own. Truly. Well, now I know this is a possibility!! HAHA. That tree is awesome! It’s the Charlie Brown Christmas Tree! I’ve returned presents under the tree but not the whole dang tree! LMAO! Yay it’s Christmas! Let the awkward family situations commence! You did great, Maria. Féliz Navidad! Um, you know here our christmas trees are “hackybush” and such like indigenous trees (torny small bushes with small leaves) Some people have just got dry painted branches as a tree, that is now very fashionable if you are not into the trandishional torny bush…..
Now you tell me!! Hee,hee. That would make life easier around here. That does look like a rather spindly tree! My way around the Christmas Tree dilemma is simply not to bother in the first place. Terrible of me, I know. Hello my dear Alarna! So nice to see you. I hope your new job is going well? Not having a tree is definitely the best suggestion I have heard yet as a solution to my problem. LOL. Hi to Pepi for me! Well, I hate to be uppity, but Christmas trees are like babies… there are no ugly ones… did you miss the whole point of the Charlie Brown Christmas special??? Well, Oh Master Ninja Uncle Arturo. I agree that there is no such thing as an ugly baby (ever) but a tree? I think it was your crack squirrels who broke off the missing branches on my ugly tree. I have learned that family, sometimes, believes they can “get away with…” 🙂 Anticipating the need to reconsider a sparse selection, I remember my Mom once buying two trees and managing to bind them together. Don’t ask me how she did that. What a smart women, your mom! 🙂 My BIL hasn’t delivered our tree yet (we just picked it out yesterday) so we shall see how it turns out. You will be sure to know if the whole thing goes south again. Smart move! I get an artificial tree when my mom is in town because she is allergic to pine but otherwise, I do real. Maybe I should reconsider. LOL. I’ve never returned a Christmas tree. But then again I’ve never bought a Christmas tree. Love the story and love your writing Maria. I honestly did not know that was even possible. Kudos to you for pulling it off! Someone I know has returned a Christmas tree. Thank you for this great post! Alleluia! I feel so much better now. Thank you for knowing someone who returned a tree (even if you lied to me) :)! Thank you also for reading.